Reminiscent of the abduction of 276 Chibok Girls four years ago, Boko Haram Terrorists (BHT) on Monday, 19 February 2018, invaded Government Girls Science and Technical College, (GGSTC), (formerly Government Girls Secondary School, GGSS), Dapchi, Bursari Local Government Area of Yobe State, Northeast Nigeria. Dapchi, a dusty, farming community sits approximately 100km from Damaturu, the Yobe state capital. Locals affirmed that the insurgents were dressed in military fatigues and turbans, that they moved into the town at about 6pm with about eight Hilux Vans and some Tata trucks bearing Arabic inscriptions. They were unchallenged, firing automatic weapons sporadically and shouting ‘’Allahu Akbar’’, meaning God is the greatest. The kamikaze gunmen were tenably strangers given that they did not know the location of the girls’ school – GGSTC even though it is just by the road leading to Gashua town. Not knowing their way around, the Kanuri speaking gunmen eventually forced some residents to show them the location of the school. They shook hands with some natives and asked them to proceed with their prayers, that they are not there for them. After abducting scores of girls, they headed east, towards Gumsa village. Open source intelligence suggests that half of the abducted Dapchi schoolgirls may have been ferried across the border into neighboring Niger Republic. Characteristic of the belated, reactive approach to security issues in Nigeria by security agencies; soldiers reportedly arrived Dapchi two hours after the attack and did not give the assailants any pursuit. 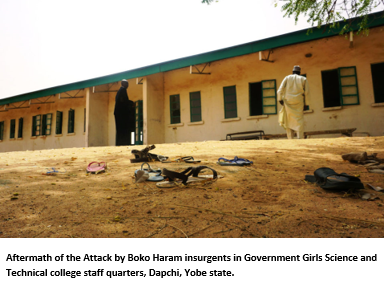 Recall that this is not the first time Boko Haram will attack a school in Yobe state. Four years ago, precisely on February 25, 2014, Boko Haram Terrorists attacked Federal Government College, Buni Yadi, Yobe State and slaughtered about 59 secondary school boys. Also recall that on November 24, 2014, Boko Haram abducted about five hundred children from Damasak while in another incident, scores of children were burnt to death on the outskirts of Maiduguri. The United Nations Children’s Funds, UNICEF, asserts that about 1,400 schools (57% of them in Borno) have been shut down, 3 million children are in need of emergency education support and over 2,000 school teachers have lost their lives to the Boko Haram insurgency. Tantamount to a déjà vu, the warm response that heralded the Chibok School girl’s abduction also played out in the case of the Dapchi School girls. If the Jonathan government’s initial skepticism and lukewarm approach is condoned on the grounds that such an incident was unprecedented, the Buhari administration’s initial denial cannot be exempted because there’s a precedent. Nigeria’s quiet president is yet to address the nation on the Dapchi School girl’s abduction. It was five days after the incident, on Friday, 24 February that the Senior special assistant on Media and Publicity to the presidency, Mr. Garba Shehu issued a press statement on behalf of his boss. The Nigerian military reportedly claimed it rescued some of the abducted Dapchi school girls but their claims turned out to be a fallacy. Seven days after dragging its heels, the Buhari administration finally confirms the abduction of 110 schoolgirls from Dapchi, Yobe state. Typical of the Nigerian establishment’s penchant for administering medicine after death, five days after the Dapchi school girls’ abduction, the Nigerian government on February 25, 2018, ordered the police and the Nigerian Security and Civil Defence Corps, NSCDC, to deploy their personnel to schools in Yobe state. What for? The Bring Back Our Girls Group (BBOG) alleges that the Buhari government is intimidating and muzzling parents of #DapchiGirls into silence. A Nigerian journalist knowledgeable about Boko Haram and presumed to have access to the Sect’s leadership, Ahmad Salkida agrees that no lessons were learnt from previous incidents. In a tweet, Mr. Salkida submits, ‘’what has been learned from the past, absolutely zero. We have an over-bloated system that still banks on a colonial structure. The system is arrogant, ignorant, disconnected and lacks the ability to adapt. The insurgents are familiar with this and have leveraged on it’’. In so-called “saner” climes, heads will roll; people vested with the responsibility of protecting citizens would have been fired or personally resigned as a result of this embarrassing mass abduction throwback. According to New York Post, the Sheriff’s officer who did ‘nothing’ to stop the active shooter in Florida, United States of America, resigned thereafter. The Dapchi school girls’ abduction tragedy prompts more question than answers. The Governor of Yobe State, Ibrahim Gaidam blames the abduction of the Dapchi schoolgirls on the unexpected ‘’withdrawal of security personnel from communities in the state’’. The governor alleges that ‘’security check points were withdrawn from Dapchi and other communities, few days before the attack’’. Was it a coincidence that Boko Haram Terrorists invaded Dapchi community shortly after the purported withdrawal of soldiers from that community? Nigerians will like to know if there was a risk assessment, who ordered the withdrawal of soldiers and dismantling of security check-points in Dapchi and other neighboring communities. Possibly an insider tipped off Boko Haram Terrorists about the prospect of troop’s withdrawal? Now that military authorities are in denial that troops were withdrawn, isn’t it negligence of duty that the soldiers didn’t confront or chase after the assailants? If soldiers were on ground, Boko Haram wouldn’t have had a free rein. If troops were on ground, they were certainly not within the school’s vicinity or roads leading to/out of Dapchi town. Also means a rapid response squad was absent. I think there’s some disconnect in the military’s claims. Moving on, where was Nigeria’s much touted Intelligence, Surveillance and Reconnaissance, ISR-capable Unmanned Aerial Vehicle, the ‘’TSAIGUMI’’ – reportedly manufactured by the Nigerian Air force (NAF)? Apart from the aforesaid drone, Nigeria is said to have the following air assets with night vision capabilities – Alenia ATR-42-500MPA Surveyor, the Beechcraft Super King Air 350i and Diamond Sensing DA42 MPP in its inventory. Why did military authorities not scramble the aforesaid aircrafts immediately the Dapchi girls were reported missing? Dr. Freedom C. Onuoha of the National Defence College, now with University of Nigeria Nsukka, submits in a tweet that, ‘’the ‘disaster’ in the #DapchiGirls is not in the occurrence but in the response. The question is where were the air assets that ought to have being deployed for ISR operation immediately to avoid [a repeat of the] #ChibokGirls incident? Just wondering! Please where do Boko Haram Terrorists keep the scores, hundreds of people they abduct? Do they have underground bunkers? Recall that more than a hundred abducted Chibok School girls are still under Boko Haram’s custody nearly four years after they were abducted. Is it rocket science to gather actionable intelligence from the freed Chibok Girls regarding inter-alia, the modus operandi of Boko Haram and where they were ensconced? While the Nigerian government is bent on freeing Boko Haram Terrorists under various guises – prisoner swap deals, wishy-washy deradicalization program, lack of evidence, the Sect is unfazed, resilient. The offshoot of the ‘famed’ negotiation between Boko Haram and the Nigerian government was the swapping of 84 abducted Chibok schoolgirls with five detained senior Boko Haram commanders and reportedly, payment of a humongous two million Euros ransom to the Islamic Sect. Similarly, we hear a quid pro quo, payment of ransom facilitated the recent freeing of University of Maiduguri lecturers and some women abducted by a faction of Boko Haram. What do you expect when a government (in)advertently becomes the chief financier of an unremorseful band of terrorists? Boko Haram have essentially trialed the efficacy and mastered the art of kidnap for ransom as a bargaining chip and manipulation. They give with one hand (release some Chibok school girls) and take (Dapchi school girls) with the other hand. Discerning minds are not surprised with Boko Haram’s relapse. My analysis published September 22, 2016: ‘’Recidivism; Unintended Consequences of ‘Amnesty’ To Boko Haram Insurgents, Militants And Chibok Girls Swop’’ and ‘’Terrorist Recidivism: Rethinking the Carte Blanche Amnesty to Boko Haram Terrorists’’ published February 7, 2018 forecasted the turnout of events. This vicious cycle, kidnap for ransom and extortion, KRE, will likely persist in the foreseeable future. Many out there, not just Nigerians are ashamed of this Dapchi school girls’ abduction saga. To paraphrase CNN’s Isha Sesay’s assertion, Buhari calling the Dapchi school girls abduction a national disaster is an understatement, it is a PROFOUND national disgrace. It follows that no lessons were learnt and no measures were put in place aftermath of the Chibok schoolgirls’ abduction to forestall recurrence. It smacks of profound intelligence failure that Boko Haram Terrorists will ‘’disappear’’ hundreds of people from the face of planet earth, without Nigerian security and intelligence agencies having no iota of clue as to where these Nigerians are holed up. Imagine the man hour, logistics and resources involved in planning, abducting hundreds of people, transporting, housing/feeding and clothing them. It is not a mean feat. This explains why doubting Thomases dispute the plausibility of the Chibok School girls abduction till date. I may be forced to concede that Boko Haram Terrorists are after all a step ahead of the Nigerian security/intelligence agencies. The Chibok and Dapchi school girls’ abduction debacle attests inter-alia that (a) The Nigerian government albeit been a signatory to the Safe School Declaration/Initiative, has failed to ensure that schools in northeast Nigeria are safe and conducive for learning (b) Contrary to the stale spin by the Nigerian government and the military, Boko Haram is still very much a threat, have not been defeated, technically or otherwise (c) Nigeria is struggling to hold on to swathes of grounds it seized back from Boko Haram (d) There are ungoverned spaces in Nigeria (e) Nigeria is systematically exhibiting symptoms of a failing or failed state. Explains why the Fund For Peace (FFP), a Washington DC-based organization, for the second time in a row, ranks Nigeria thirteenth least stable country in the world out of 177 nations appraised in the 2017 Fragile State Index (FSI). The least Nigerians expect is that some people up there in the security echelon should take responsibility for this massive international embarrassment, security, intelligence failure and do the needful – throw in the towel – or be sacked. By the way, Boko Haram Terrorist group have metamorphosed into a political game changer. The Chibok school girls’ abduction was one of Goodluck Jonathan’s undoing; contributed to his unsuccessful reelection bid. Buhari is in tow. Don Okereke is a Security Analyst/Consultant, Writer, Public Speaker and Change agent with 20 years combined Military and Private Security, entrepreneurial experience/skills distilled from Nigeria and the United Kingdom. Don loves entrepreneurship; he is the Founder/CEO of Forenovate Technologies Limited (RC 755695) and Holistic Security Background Checks Limited, an emerging offshoot of the former. Inter-alia, Don completed postgraduate modules in Forensic Engineering & Science from Cranfield University (Defense Academy), Shrivenham, United Kingdom, a first degree in Industrial Chemistry, a Professional Certificate/training in Communication and Conflict Management from the United Kingdom National Open College Network, a Certificate in Security Practice & Safety Management and a Certificate of Accomplishment in Terrorism & Counter-terrorism: Comparing Theory & Practice from Leiden University (MOOC), Netherlands. His interest and expertise span Background Checks/Screening, Threat/Risk Assessment and Management, Due Diligence/Private Investigation, Security/Safety/Cultural Awareness Training, Geopolitical Risk and Travel Advisory, Security Loss/Fraud Prevention, Executive/Asset Protection, Research and Open-Source Intelligence (OSINT) Information Retrieval, Countering Violent Extremism (CVE) Advocacy and Public Speaking, amongst others. His knack and passion for harvesting information from formal and informal sources, writing, creating security awareness galvanized him into blogging. His articles are published on major Nigerian newspapers such The Guardian, The Nation, NewsWatch, Tell Magazine and various reputable local and international platforms. Don has featured on conferences/seminars as a Guest Speaker and he is routinely consulted by foreign, local, print/electronic organizations such as the BBC Focus on Africa Programme, French AFP, Broadcasting Corporation of Oyo State Television, NTA, and Television Continental amongst others, for his expert opinion on issues impinging national, personal security and geopolitics. As a change agent passionate to add value and to render altruistic service to humanity, Don champions a countering violent extremism and security awareness advocacy/Cause - Nigerians Unite Against Insecurity and Terrorism’’.